Call Today or Schedule An Appointment Online! Cellular Necessities can fix your broken iPhone and Smartphones today! Learn more by visiting a link below. 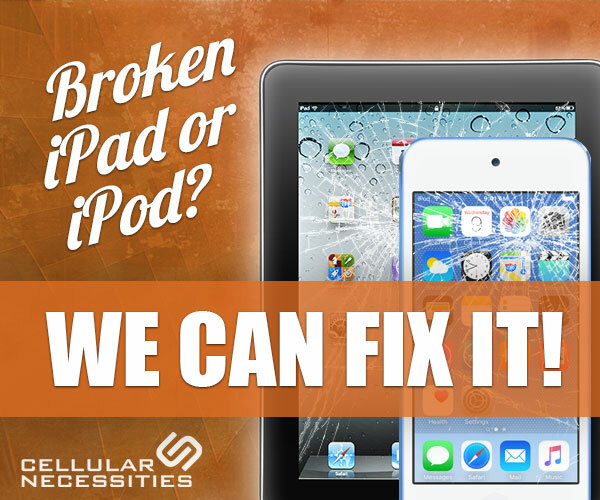 Cellular Necessities can fix your broken iPods and iPads today! Call or stop in at our two locations for a free estimate! Contact Our Castleton Square Mall (317-841-0996) or Greenwood Park Mall (317-883-4473) locations today! Dropped cell phones which cause screen cracking is the #1 repair issue we have seen over the past years. Phone cases normally provide a protective shell around the phone to help absorb the shock when dropped. dropped my Samsung Galaxy S3 and cracked the screen. They were able to get me in quickly, repair it very quickly and the job was done perfectly. Customer service was fantastic too. I cracked the screen of my iPhone 5 and was afraid I would have to use my insurance to get a new phone. Instead, I came to Cellular Necessities and my phone was repaired in 20 minutes! Cellular Necessities is strategically located on the north and south side are easily accessible. We can get your iPad and or iPod fixed in no time! Learn about our economic rates. Our team can quickly repair your iPhone or smartphone getting it back to new! Give one of our locations a call today and receive a free estimate on the repair of your device.